Last Sunday Lulu & I got stuck into the front garden. 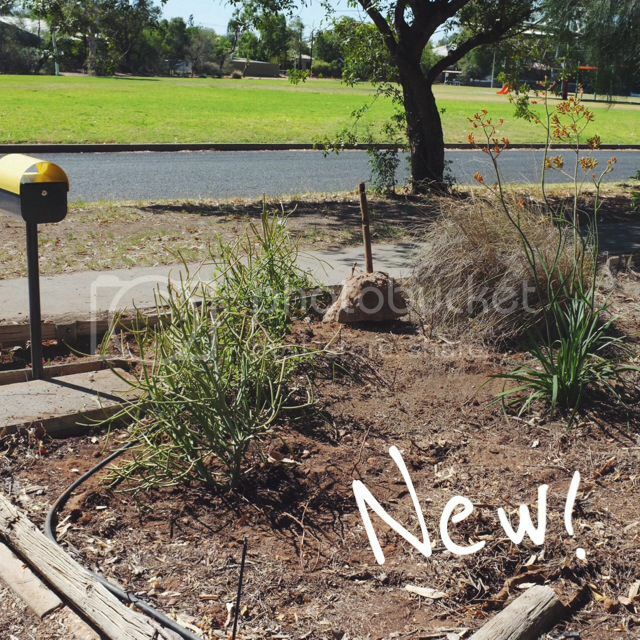 Having 'lost' our hideous old mail box a few weekends ago and replaced it with a modern mailbox, the front yard looked ready for a few hearty natives that might thrive in a sunny spot. Lulu & I arrived at the local plant shop just as it was opening - my goodness how quickly I've forgotten that not everyone has been up since 6am! The shop has a box of toys that Lulu is quite familiar with and she dived into the box after saying hello to the owner's dog, Peggy Sue. I quickly found the plants I was looking for and a set of small desert flowering plants (Portulaca Cocktail) for the front garden. We packed up the toys and walked the plants home in two goes. Luckily our pram is easy to steer with one arm! Lulu helped dig the holes (ie fill in the holes while I dug them) and she loved watering the plants once they were in. Once all the plants were in the ground I embarked on tidying up the pathways around our garden & pulled out four bins worth of dead leaves and sticks! Lulu will no longer be trapped walking to our tap. Anyway, please admire our new letterbox below and the concrete stump to the right that remains as a memorial to the old one (I promise it is not staying!). You can read about what happened to the poor old letter box here. Kangaroo Paw on the far right & two green spindly bushes to the right of the letterbox (I've forgotten what they are called). The Portulaca Cocktail flowers are out of fame in front of the new letterbox.